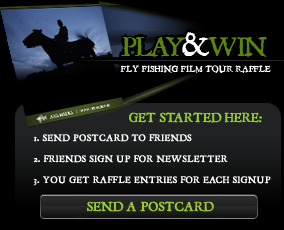 Tickets for the AEG 2008 Fly Fishing Film Tour are now on sale. Click here to reserve your tickets. Also note that AEG will be giving away great prizes from their sponsors: Loop, Patagonia, Costa del Mar, Scientific Anglers, Rising, RO Drift Boats, Water Masters, Brunton, Gerber, Big Agnes, Loon and The Drake. A new prize will be given each day until the start of the tour, January 30th (Ventura, CA). The winner's names will be announced every day at 10 a.m. PST. GOOD LUCK!